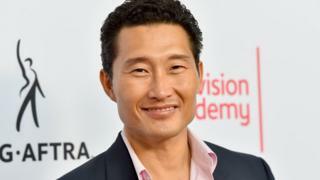 Actor Daniel Dae Kim has been confirmed for the Hellboy reboot, two weeks after British star Ed Skrein dropped out amid accusations of "whitewashing". Kim said he applauded his fellow actor Skrein "for championing the notion that Asian characters should be played by Asian or Asian American actors". He added: "He could not have addressed the issue more elegantly and I remain indebted to him for his strength of character." Skrein, who starred as villain Ajax in Deadpool, made headlines when he stepped down last month "so the role can be cast appropriately". At the time, Skrein said in a statement: "It is clear that representing this character in a culturally accurate way holds significance for people, and that to neglect this responsibility would continue a worrying tendency to obscure ethnic minority stories and voice in the arts. "I feel it is important to honour and respect that." Image caption Ed Skrein said he couldn't represent the character "in a culturally accurate way"
Film studio Lionsgate concurred, saying: "It was not our intent to be insensitive to issues of authenticity and ethnicity, and we will look to recast the part with an actor more consistent with the character in the source material." Kim left Hawaii Five-O earlier this year, saying he had "made the difficult choice not to continue" after failing to reach an agreement with CBS. A turning point for Hollywood whitewashing? "The path to equality is rarely easy," he wrote in a lengthy Facebook post in which he encouraged his fans "to look beyond the disappointment of this moment to the bigger picture". The producer of the US TV show then spoke about the departure of Kim and fellow star Grace Park following reports that the pair had asked to be paid the same as their white co-stars. Peter Lenkov said both actors were offered "unprecedented raises" but "chose to move on". "It's heartbreaking, but this happens on long-running shows," he wrote in a statement on Twitter. Kim and Park had appeared in the show since its inception in 2010. According to Variety, the pair had been seeking the same salaries as stars Alex O'Loughlin and Scott Caan but were being offered between 10% and 15% less. Kim has appeared on shows such as ER and Angel and made his name on ABC's Lost before joining Hawaii Five-0.